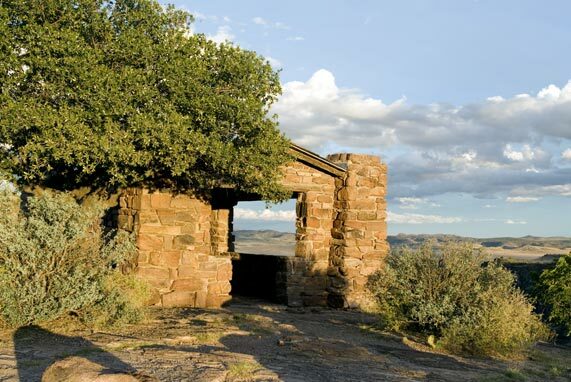 Enrollees in Company 881 constructed Skyline Drive from Keesey Canyon up to the top of the ridge, dividing the canyon from the town of Fort Davis. The crew hacked and blasted the road along the narrow ridge. There was space enough for only limited amenities: a comfort station (latrine), a lookout shelter, and a picnic area. All were built of local stone, hand-shaped and laid up by the CCC. The roof structures were framed with locally cut pine trees. The lookout shelter, shown here, provides a 360-degree view of the surrounding terrain.